Many people are working hard to preserve historic stone walls all over New England. To add fuel to this fire, I wrote many essays during the early years of the SWI, several of which were reprinted nationally. Below are are five examples. Reprinted from the New York Times, October, 8, 2006, an invited editorial. “‘Something there is that doesn’t love a wall,” Robert Frost wrote a century ago. The poet speculated that frozen soil, or perhaps elves, were to blame for the upset stones he encountered on his walk. 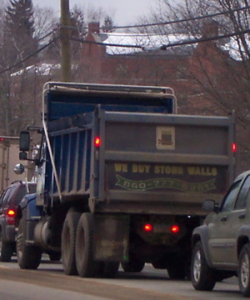 Recently, however, I’ve concluded that the biggest threat to old stone walls is people.” …. To read more, link to Strip Mining History. Reprinted from Connecticut Preservation News, Vol. XXV, No. 5, Sept/Oct 2002, p. 11 and 16. 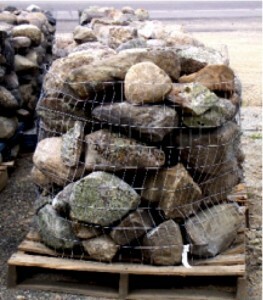 Pallet of stone, taken from an old wall, and ready for truck shipment. I once saw abouto 20 of these on one truck load, heading west on Interstate 84. I’m in traffic. It’s raining. On the eighteen wheeler next to me are pallets of strip-mined stone heading west, perhaps for California. This is a bad idea. … To read more, link to Seven Good Reasons. Wall being built below an in on Popham Point, ME. Pallets of strip-mined stone (upper right) and being transformed into a new wall (lower left) above plastic. In the process, archaeology becomes architecture. New England’s collection of stone walls should be viewed as a cultural commmons, owned legally by individuals, but culturally by us all. No one owns the landscape. To read more, link to The Stone Commons. Reprinted from the Hartford Courant, Sunday, December 1, 2002, p. C1. This Amish quilt is something lovely made from something used, just like stone walls. Image source is a reference book on folk art . The walls surrounding our patchwork of farms, forests, suburbs, and villags are like the threads that bind the squares of a quilt together. Their destruction is similar to unraveling a quilt. 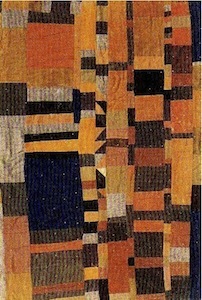 To read more, link to Unraveling the American Quilt. Reprinted from the Newsletter of the Connecticut Forest and Parks Association (citation pending). 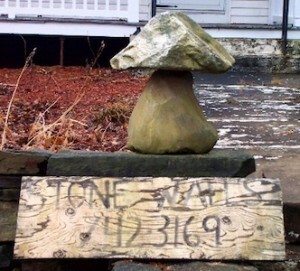 Like wooden decoys, weather vanes, and whirlygigs, stone walls qualify as folk art. Stone walling is the outdoor equivalent of weaving. Hence, it is best viewed as a form of statuary folk art. To read more, link to Weaving the Landscape.